By Maria Alive	Posted in	Blog	2 Comments	Click any image for an enlarged view. In its best sense, High Level Wellness is all about living with a sense of joy in our bodies, an air of contentment in our minds, and a direct connection to that greater force of consciousness. The whole concept describing the components that orchestrate and animate the body in movement, and the increased exploration along new pathways of understanding the nervous system, are now opening wide new doorways to how we can best optimize posture and body mechanics. Movement Specialists from a variety of fields can now more easily take the leap from outdated static concepts of the Anatomy of Movement or Kinesiology. We can look at an individual’s structural injury, pain and other physical imbalances; and how their body compensates as a multidimensional window into the many facets of that person’s life and lifestyle. Along with this shift in the world of Functional Movement, we are witnessing an explosion of new integrative working teams forming. These otherwise very diverse sectors in the healing fields are coming together to give the best of what their fields offer while providing their clientele with the customized team-based approaches that we as Humans have always required. Functional Yoga Therapy is founded on the basic premise that healing and all of its varied components and definitions is non-linear, multifactorial and in its greatest sense a state of internal equilibrium based on mind, body and spirit. Using this concept, a practitioner can facilitate some of the best care for a client. Dr. Swidler’s comments on High Level Wellness discuss “optimizing the highest state possible as a personal best in whatever condition we are currently functioning at.” This best optimal function possible for our condition is our internal state of equilibrium. It is a personal condition, and one from which a person can step forward in seeking what’s next. It is also what the therapeutic team can take into account as their current baseline in setting new goals and creating treatment protocol for this client. Fluid Body Dynamics (FBD) is riding the wave of this paradigm shift; combining the best of functional movement therapeutics, cranial osteopathic techniques, specialized bodywork, and holistic dentistry to offer a fully integrative system of care addressing Non-Invasive TMJ. The first fully comprehensive system of its kind, FBD looks to define the jaw joint position as the quintessential link in creating ease and comfort in the body. There are many excellent TMJ dysfunction practitioners; however FBD looks to each case as unique, addressing not only jaw misalignments, but also the full body and how it’s structural components are reacting and acting to the jaw’s imbalances. Years in study and creation, the main practitioners of this program have worked separately on the important components of the FBD approach; coming together to cross-refer clients, discuss outcomes and lecture in various programs. New in 2016, Fluid Body Dynamics will open its doors to seeing TMJ Dysfunction clients in one setting – in Tucson, Arizona; with a Case Manager to facilitate the integrative needs of each client. As an example of this new work, FBD does a simple assessment to determine if the jaw/bite is a primary factor in dysfunction in other areas of the body. If this differential diagnosis reveals foundational issues beginning in the jaw/bite and its alignment, the practitoners then utilize specific protocol developed by Fluid Body Dynamics to stabilize, strengthen and re-educate new body use patterns. Some of the key components of this protocol to release the held body restrictions (like the “layers of an onion”) include: specialized body work for releasing held physical and emotional injury patterns, movement specialists (such as those trained by Functional Yoga Therapy) to help stabilize, strengthen and re-pattern the body. Many clients also need specialized temporary mouth appliances to stabilize this new pattern, and create a biofeedback tool concept that helps in re-patterning the nervous system. Fluid Body Dynamics also seeks to share this protocol and positive outcomes with TMJ practitioners and Movement Specialists around the World. The long-term goal is to create new Integrative Teams in TMJ care everywhere. Functional Yoga Therapy Level 2: This program builds upon the foundations learned in FYT Level 1 of Advanced Assessment techniques; adding in new concepts in neuroplasticity, Neurokinetic Therapeutics, further protocols working with Somatics, as well as uses of specialized tools to promote healing; Ayurvedic concepts of assessment and treatment, and more work with healing the deep nervous system through Subtle Body Techniques. NOTE: this course will include clinic time with Fluid Body Dynamics and the Integrative Team working with non-invasive TMJ. Functional Yoga Therapy Level 1- Advanced Assessment Techniques: This course, offered twice per year for the last 8 years is for all Movement Therapists to help in learning specific advanced assessment and treatment techniques working both privately and in small groups with clients. NOTE: This course has a new manual, with new assessments and revised protocols, now also available digitally to prior graduates. This course also introduces the practitioner to The Fluid Body Dynamic system of TMJ work. 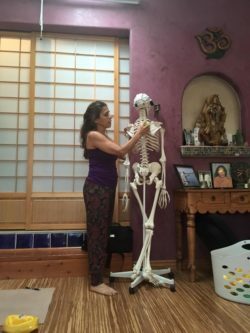 Advanced Cranial Techniques for Movement Specialists: This course will be taught as an add-on to the above Functional Yoga Therapy Level 2; and can also be taken separately. NOTE: level 1 below is also offered in 2016. These hands-on techniques are quick and effective as both assessment and treatment, combining wonderfully with all of the other Movement Specialist techniques. Level 1: An advanced approach of understanding the body’s internal rhythm, and its methods of restricting and compensating after injury. This level 1 course offers specific assessment tools and treatment techniques from the fields of manual cranial osteopathy and Dr. Steven Swidler’s TMJ research. This course provides an immediate hands-on skill set that can be combined with other specific practitioner tools: Overall body releases (circuit breakers) and the main cranial strain patterns. Level 2: The focus of this course is the identification and release of all 29 cranial bones – specific to working with traumatic incidents. This course builds upon Level 1 teachings, with “live client” interface in the Fluid Body Dynamics clinic. Creating the New Integrative Team for TMJ: This course will be focused to dentists, orthodontists, Osteopaths, Chiropractors and other TMJ practitioners with specifics on how a Fluid Body Dynamics team can function in their current settings. Full protocols and specific team member trainings will be provided. NOTE: Those practitioners that have taken the above training (as well as Functional Yoga Therapy Level 1) will be referred to the Practitioners offices seeking to create their new integrative teams. Movement Specialists: The author of this article has taken the liberty of coining this term in describing the new paradigm of several different practitioner fields working with structural issues in the body; specifically: Yoga Therapy, Pilates and Fitness Therapy, Physical Therapies,, Somatics Movement Therapies, etc. Dr. Halbert Dunn, a forward-thinking consultant to the World Health Organization in the 1950’s and 1960’s, first coined the term “High Level Wellness;” and also published the book with the same name in 1961. 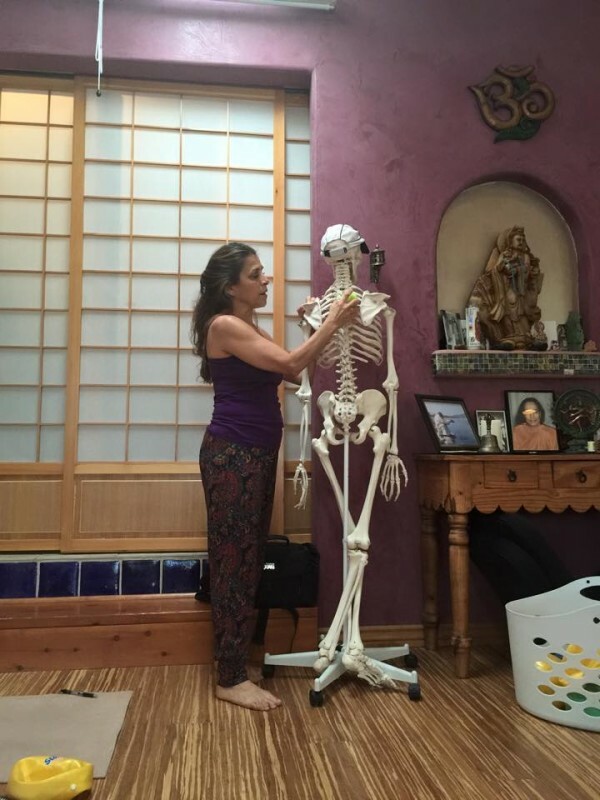 Functional Yoga Therapy™, founded by Maria Mendola, is a set of assessment and treatment protocols as well as an advanced school to these techniques. As defined by the traditional concept of yoga, Functional Yoga Therapy takes in all of the multifaceted dimensions of each individual human as the basis of a deeper and more complete healing experience. Swidler, Steven – 2015 Lecture notes from Advanced Cranial Techniques class taught to Movement Therapists and Body-Workers. Fluid Body Dynamics is a new merge of the work from both Maria Mendola and Steve Swidler related to Temporal Mandibular Joint Dysfunction. NOTE: They both continue to offer all of the other facets of their healing work and education separately with their individual businesses and schools.